Based on the play by Donald Bevan and Edmund Trzcinski, Stalag 17 is the story of a group of American prisoners at a German World War II prison camp who try to find out who is working for the Germans as an informant. Directed by Billy Wilder and screenplay by Wilder and Edwin Blum, the film is a war film set in a prison camp where a group of men try to figure out who had fingered them as they would all suspect each other as it’s narrated by Gil Stratton. Starring William Holden, Don Taylor, Robert Strauss, Neville Brand, Harvey Lembeck, Peter Graves, Sig Ruman, and Otto Preminger. 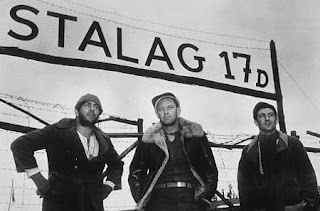 Stalag 17 is a rapturous and lively film from Billy Wilder. Set entirely in a German POW prison camp where American pilots are imprisoned at the camp known as Stalag 17. The film revolves around a group of men trying to escape but a botched attempt raise questions into what went wrong as some believe there’s a mole in their camp. While it’s a film with a simple premise, it also explore life at a prison camp where many Americans live in a cabin with someone elected as security while at the other side is a camp where the Soviet Union prisoners are. Notably as the Soviet prisoners are women which does excite some of the men who hadn’t seen women in a long time but there is trouble as they’re all under the watch of the Germans led by Colonel von Scherbach (Otto Preminger). The film’s screenplay by Billy Wilder and Edwin Blum begins with a prison escape of two men who had done everything carefully until they’re caught and killed by the Germans setting the tone for the rest of the film. Among the characters that are prominent in the film are the clowns Stanislas “Animal” Kuzawa (Robert Strauss) and Harry Shapiro (Harvey Lembeck), the toughie Duke (Neville Brand), the silent musician Joey (Robinson Stone), the no-nonsense cabin chief Hoffy (Richard Erdman), the cabin security chief Price (Peter Graves), and the cynical J.J. Sefton (William Holden) as they all try to make sense over what happened to the two prisoners who were killed though Sefton is the one who knew they wouldn’t make it. Sefton is seen as a suspect as the only person that trusts him is the film’s narrator Cookie (Gil Stratton) who helps Sefton with some of the business ventures he have with the other cabins which make him a suspect as he was seen walking back from the Soviet prison camp during the film’s second act. Yet, Sefton knows there’s a mole in the cabin as he know it isn’t him though he understands why he’s a suspect due to the things he has. During the film’s second act when a couple of new prisoners come in as one of them is an officer in Lt. Dunbar (Don Taylor) as he is suspected of being involved in a sabotage towards a Nazi-German train as he’s being interrogated by Col. von Scherbach. It’s around this time that Sefton knows he’s been targeted as a suspect as he tries to figure out for himself who is the mole as little clues would emerge. The third act isn’t just about Sefton finding out who the mole is but also the little details into the clues as well as the level of communication given from the mole to Col. Von Scherbach through the officer Sgt. Johann Sebastian Schultz (Sig Ruman). All of which would climax during the Xmas period as well as news about Lt. Dunbar who is about to be given to SS officers. Wilder’s direction is definitely intoxicating for the way he creates this world that is the prison camp while maintaining something that is kind of claustrophobic for the way the cabins are presented from the inside as it’s often crowded. Shot on location near the San Fernando Valley in California, the camp itself is a character in the film as it is muddy and grimy where the characters have to deal with the drab conditions though they’re given bits of comfort in their cabins under the rules of the Geneva Convention. While there’s some wide shots over the locations as well as scenes of the prisoners looking at the Soviet camp from across the border as it would include a very funny scene in which Animal and Shapiro would go across to the Soviet camp to meet the women while pretending to paint road lanes. Much of Wilder’s direction is more intimate as it play into some of the theatrical elements of the story. Wilder’s approach to medium shots and close-ups would help play into the attention to detail into some of the things that goes on inside the cabin such as a hanging light bulb display. The sense of claustrophobia inside the cabin help play into some of the film’s humor but also the suspense such as the opening sequence as well as the visit from an official of the Geneva Convention (Erwin Kasler). When it comes to the film’s third act and Sefton’s discovery of the mole, it is presented in a very restrained manner as it help build up the tension as well as the climax of another prison escape that involves Lt. Dunbar. Wilder’s usage of the claustrophobia in the cabin as well as the camera showing all of the prisoners as they learn about the identity of the mole as it’s a moment that is just powerful but also scary. Overall, Wilder crafts a riveting yet evocative film about prisoners trying to find a mole in their cabin at a German POW camp. Cinematographer Ernest Laszlo does brilliant work with the film’s black-and-white photography from the look of the interior/exterior scenes at night as well as some of the brightness in some of the daytime scenes. Editor George Tomasini does excellent work with the usage of rhythmic cutting to play into the humor as well as some of the suspense. Art directors Franz Bachelin and Hal Pereira, along with set decorators Sam Comer and Ray Moyer, do fantastic work with the look of the cabins as well as the cabin of the camp’s commandant as it is more spacious to play into his personality. Sound recordists Gene Garvin, Harold Lewis, and John Carmada do superb work with the sound as it play into the some of the moments inside the cabin as well as the sound of gun fires and air sirens. The film’s music by Frank Waxman is amazing for its military-inspired score with a lot of cadence drumming and percussion arrangements as well as the usage of traditional military music as well as some of the contemporary music that was around in those times. The casting by Bill Greenwald is great as it feature some notable small roles from Peter Johnson and Michael Moore as the two prisoners escaping in the film’s beginning, Erwin Kasler as the Geneva Convention official inspecting the condition of the camps, Robert Shawley as a prisoner known as Blondie who is good with radios, William Pierson as the mailman prisoner named Marko, Robinson Stone as the mute musician Joey, and Gil Stratton as the film’s narrator and Sefton’s aide Cookie as a man that knows Sefton might not be the mole but know that Sefton has put himself into trouble with some of his activities. Sig Ruman is terrific as Sgt. Johann Sebastian Schulz as an officer who watch over one of the cabins that the prisoners are in as well as be the liaison for the secret message between Col. von Scherbach and the mole. Richard Erdman is superb as the no-nonsense prisoner Hoffy who is the cabin chief for the prisoners while Peter Graves is fantastic as the cabin security chief Price who watches over the prisoners and make sure they don’t get in trouble. Neville Brand is excellent as the tough prisoner Duke who is very suspicious of Sefton as he is someone who cares about his fellow brothers. Harvey Lembeck and Robert Strauss are brilliant in their respective roles as Harry Shapiro and Stanislas “Animal” Kuzawa as the two comic reliefs who provide some mischief with Shapiro as the talkative of the two while Kuzawa is the man who fantasizes about being with Betty Grable. Don Taylor is amazing as Lt. Dunbar as a new prisoner who has been targeted by Nazi officers over a mission he may not have been involved in as it becomes clear that he is about to go to a worse place than the POW camps. Otto Preminger is incredible as Colonel von Scherbach as this very eccentric officer who never puts his feet in the mud as he’s this charming individual that is quite evil but is determined not to lose any prisoners. Finally, there’s William Holden in a phenomenal performance as J.J. Sefton as a very cynical prisoner who has managed to use his gambling wins and dealing to make his life in prison comfortable only to get himself in trouble as he becomes the most likely suspect as a mole where he is determined to uncover the truth. 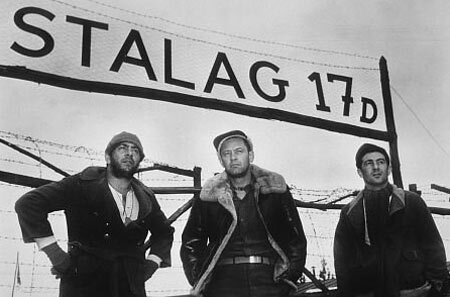 Stalag 17 is a tremendous film from Billy Wilder. Featuring a great ensemble cast, top-notch suspense, lively humor, and claustrophobic setting. It’s a film that showcases the world of the POW camps as well as men needing to survive as well as find out who has been ratting them out to the Nazi. In the end, Stalag 17 is a spectacular film from Billy Wilder. Pure classic through and through. This has been on my "revisit" list for months now.